I’ve been waiting and waiting for the day to come when I could post this recipe. It could not be a more yummy and appropriate treat for Valentine’s Day. 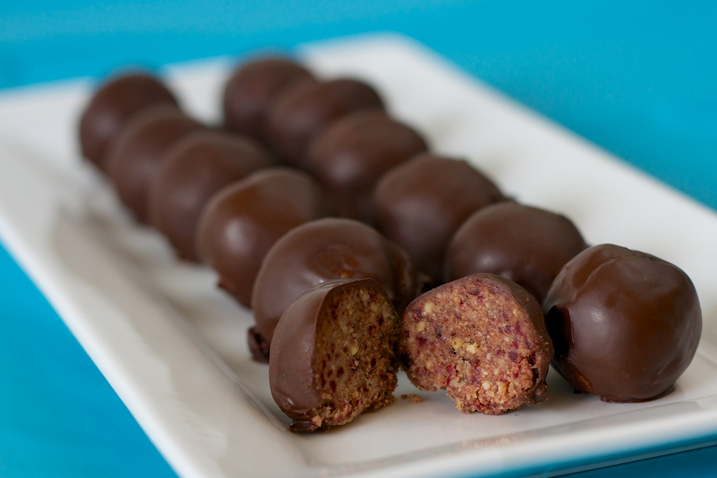 One batch makes about 3 dozen chocolate-covered, protein-spiked, cherry-bright treats. Each ball contains 2-3 grams of protein, and a nice amount of fiber and healthy fat, so it doesn’t take too many to satisfy heavy-duty cravings. Perfect thing to whip up and take into the office, or pack up for your honey. What better way to say, “I love you” than to make from scratch a healthy, delicious alternative to those heart-shaped, nothingbutsugar somethings we buy for our loves (horrors!) at the grocery store. Cherry Power Balls started out 30 years ago as a recipe in Laurel’s Kitchen and were a thing I made time and again when my sons were small, and gradually revised the recipe to the point that it had little relationship to the original—I even had a rum-laced version I made for holiday gatherings. When Phil and I went vegetarian in 2010, I dug them out as a way to shore up our blood sugars and help with protein intake (not the rum version, hopefully rather obviously). We made them by the dozens to take to readings when Blue Moon Vegetarian came out. That version is called “Protein Balls.” One day I didn’t have most of the ingredients, so I worked with what I had on hand, and something completely new was born. The book’s photographer, Suzi Hathaway, kept calling them “Power Balls” on the day we were shooting them—so many times that I declared that must be their new name. NOTE: I only mention brand names because I have experimented with every kind of peanut butter when making this recipe—even fresh ground, but the Kirkland brand brings the most chewy texture, which is one of the things I like best about this particular version. Enjoy Life Chocolate is vegan and gluten-free and is my favorite chocolate in a bag. Process the first 9 ingredients (but only 1 tablespoon of the coconut oil) in a food processor until very smooth and well-blended. Shape into 1” balls. Moisten hands as needed with coconut oil to keep from sticking. Melt chocolate and remaining coconut oil in a small pan over low heat and combine. Dip balls into mixture and set on a plate lined with parchment paper. Cool in the refrigerator until set up. Stores nicely in refrigerator for up to 2 weeks. Makes 3 dozen balls.